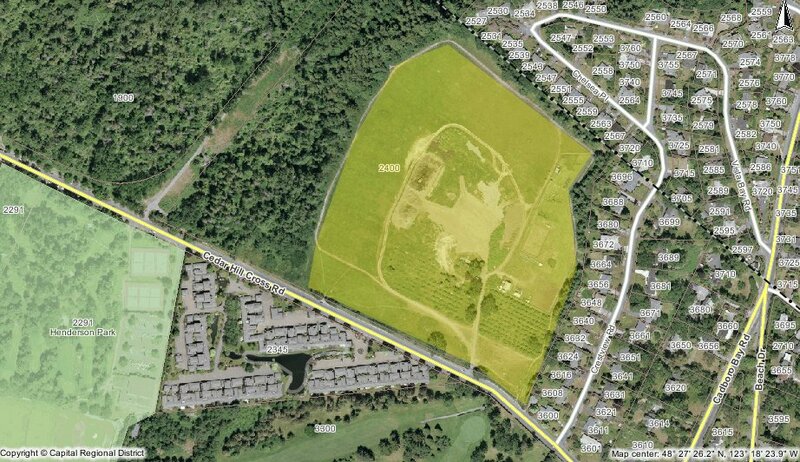 UVic Sustainability has finally decided to develop a plan for the Cedar Hill X Rd. lands. Yes, those same lands that the CRD considered for a Saanich East/Oak Bay sewage treatment/pumping plant earlier this year. (For reference, it is outlined in yellow to the right). Like most areas, there are a lot of interested parties, including dog walkers, UVic Facilities, UVic Forest Biology, and the local community. Some of those users don’t see eye to eye, so balancing those conflicted needs should be interesting. 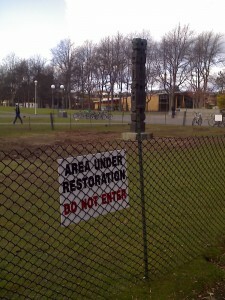 This isn’t the first time a plan has come up for the site, although it seems that everybody but UVic has been involved. 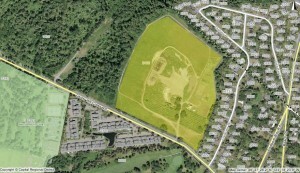 Proposed for the site in 2009 was a “UVic School of Agriculture” by the Campus Urban Agricultural Collective (Facebook page). At the time the draft plan under discussion was but an apple in the eye of then-UVic (now CRD) Sustainability Coordinator Sarah Webb, as she mentioned the Marlet in a story about the CUAC. Earlier this year the Food Not Lawns Collective co-opted that idea and dumped it into their manifesto (as they dug up the lawn in front of the library, possibly killing all their credibility in the process). Disappointingly, the plan doesn’t talk at all about the road immediately adjacent, which includes parking in the area, or of better pedestrian access. Currently Cedar Hill X Rd. has a number of problems: too wide, lack of sidewalks on the north side, lack of bike lanes, and its use as overflow parking from UVic, the Rec Centre, both golf courses, and Emmanuel Baptist Church. Yes, the road is under the control of Oak Bay, but that shouldn’t stop UVic from making a stronger statement. And Oak Bay should listen. After all, they are the adjacent land owner and we go to great pains to query other adjacent land owners when we put in improvements like bike lanes. Observe the recent bike lane work on the other side of Cedar Hill X Rd. However, I am cautiously optimistic. The drop dead date for getting your comments into UVic is November 26th. You can read more at the UVic Sustainability Planning site. 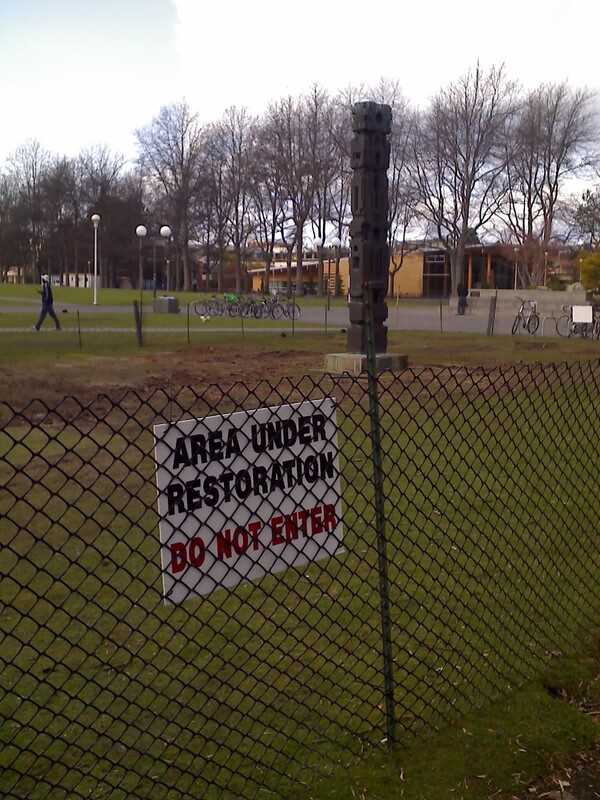 Despite my predictions to the contrary, UVic Grounds moved in last night, went to town with their heavy machinery before putting up a beautiful fence. Ball’s in the guerrilla gardeners court now. What exactly do they want? The first and most logical demand is for new community garden space, preferably smack in the middle of campus. They also want a giant educational farm, 15 acres be exact. Their suggested location: Cedar Hill X Rd. lands. Given the lands were once a farm and still have fruit trees, these ideas seem fairly reasonable so far. Still in the reasonable category is the idea of more fruit trees on campus, to take advantage of Victoria’s Mediterranean-like climate. It is their time-frame and scale I quibble with: 500 trees in five years. Trees take a decade or more to mature. Simpler would be to change (or subvert, depending on your worldview) UVic’s natural tree replacement and addition programs. The only work needed now revising whatever plan already exists. And now we get to the insane. A department of agriculture? With 6 full time faculty? Aside from the small matter that UVic seriously lacks office and classroom space for its existing courses — let alone a brand new department — where is the money going to come from? What are they going to teach? And more cynically, what kind of monetization is possible? So I say: get thyself to UBC. They are BC’s agriculture specialists. Have been for a long time. No need to duplicate that. The rest are a wash. Ten acres of ethnobotanical gardens? A LEED certified building? 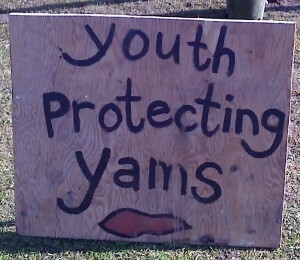 A food harvest festival? Interesting and not impossible. Surprisingly, the garden in question is still in existence as of today. Like the rabbit problem, I suspect the university will wait for the summer to deal with it. Less students to chain themselves to bulldozers/live-traps that way. 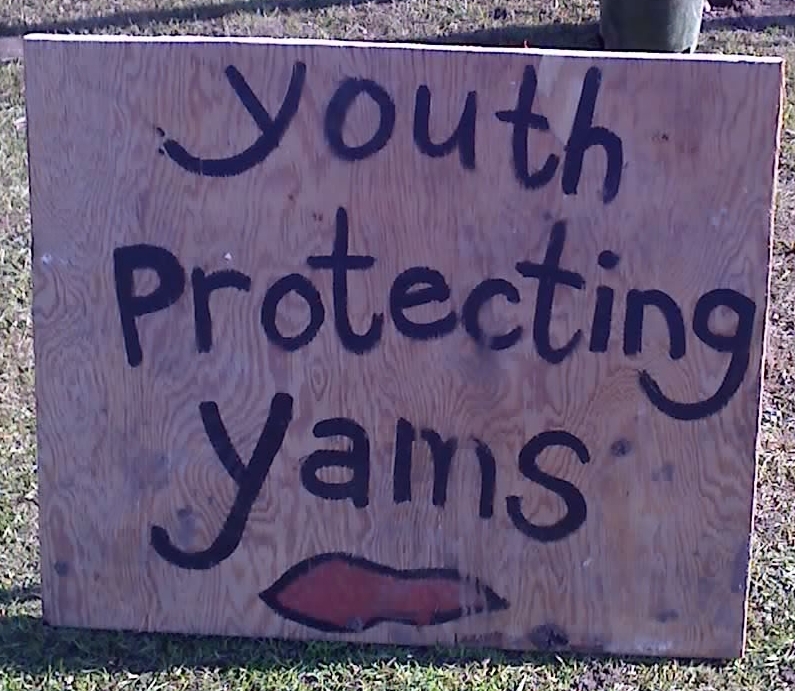 Youth protecting Yams, satirical take on the Youth protecting Youth issue*. The guerrilla gardeners at UVic have — technically still are — struck again, replanting the garden in front of the McPherson Library. With the current community gardens under threat of being turned into a warehouse, students decided to take direct action and plant a garden in the middle of UVic. That work was subsequently ripped out by UVic in the middle of night, spawning this second effort. While the UVic Student’s Society, perhaps not surprisingly, lacks an official position on the ad-hoc community garden, one of the senior UVSS people I spoke to said the UVSS lacks even a more generic statement of support for community gardens at UVic and that it ” might be a good idea”. What happens next is anyone’s guess. Several people I spoke to seemed to think that the university will likely wait until the summer to rip out this garden 2.0, mostly to avoid further confrontation. Bunnies might not be the only things getting culled this summer. *Youth Protecting Youth is a pro-life group that was denied club funding by the UVSS due to their use of shock tactics with images of aborted fetuses.